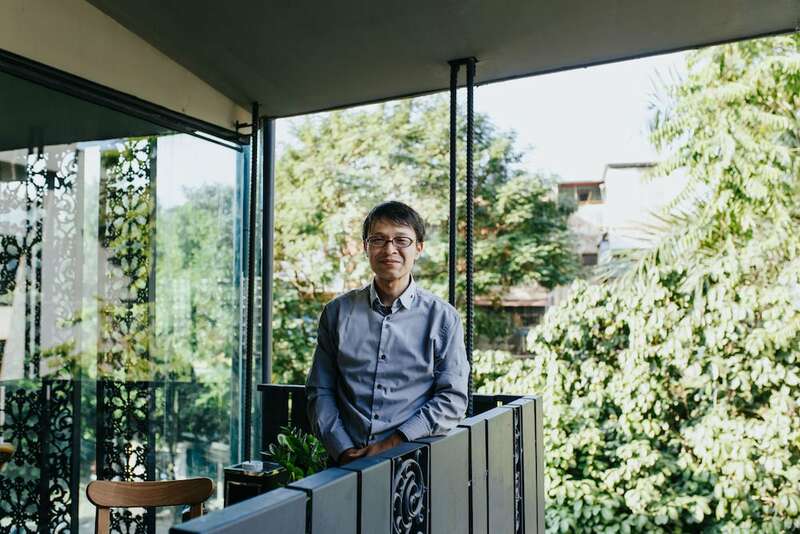 Eight years ago, the Japanese architect Takashi Niwa moved to Vietnam at the invitation of his college friend Vo Trong Nghia to join Vo Trong Nghia Architects (VTN) as a partner. 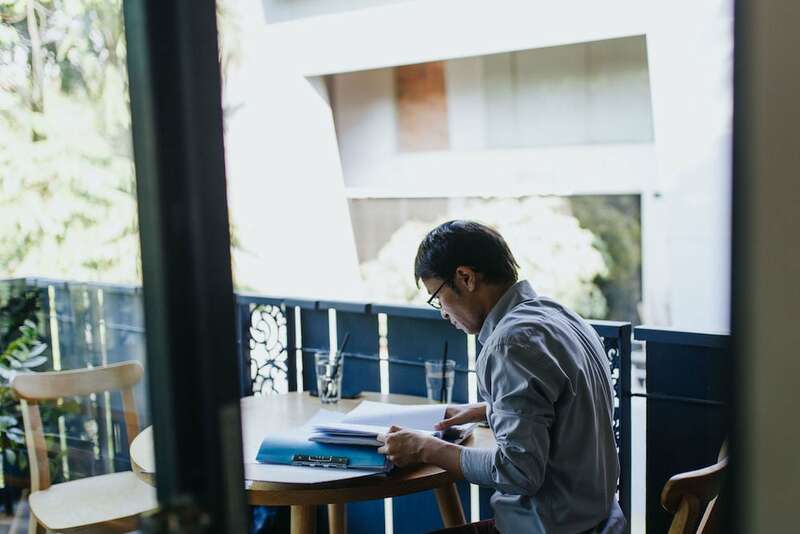 Here, he opened VTN’s Hanoi office and, after gaining several years of experience in Vietnam’s industry, he launched his own firm in order to take on more experimental projects. 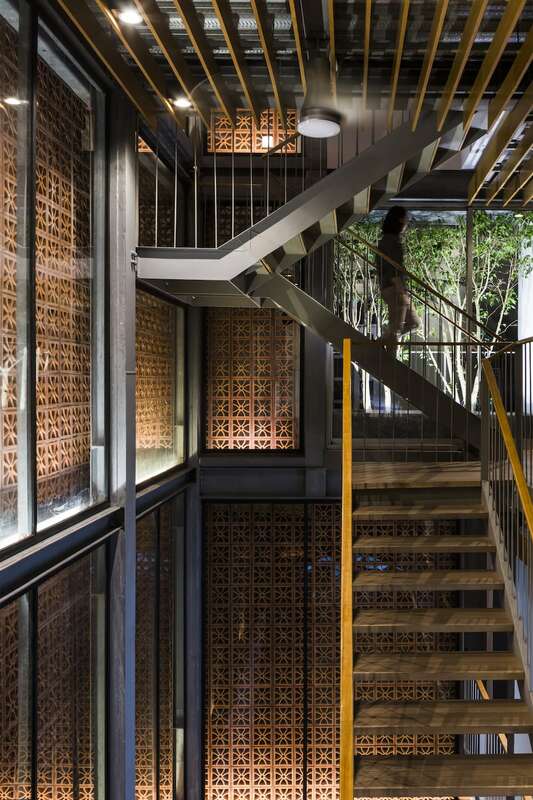 In his time in Vietnam, both with VTN and his own firm, Takashi Niwa Architects, he has worked on several big projects including the award-winning Farming Kindergarten in 2013, the Pizza 4P’s Phan Ke Binh, and the Nanoco Gallery. Takashi Niwa inside the Pizza 4P’s Phan Ke Binh, Hanoi, which he designed. 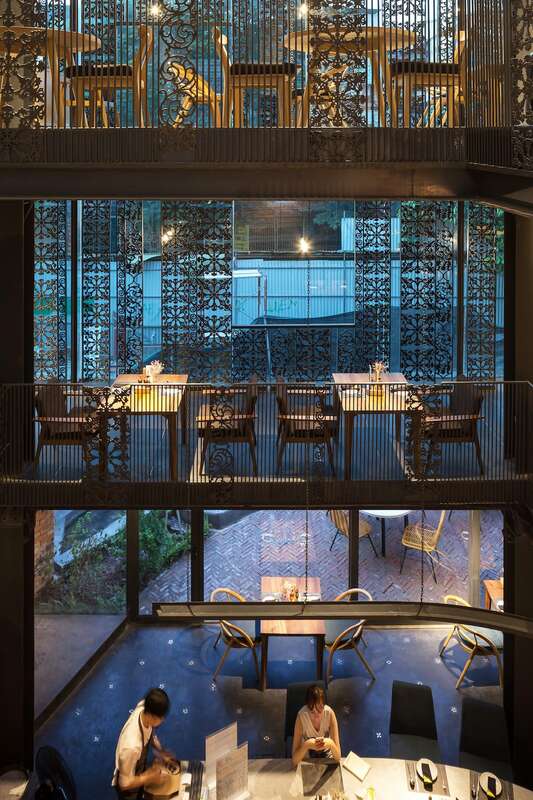 So Vietcetera caught up with Takashi Niwa on the balcony of Pizza 4P’s Phan Ke Binh, one of his most recent designs. 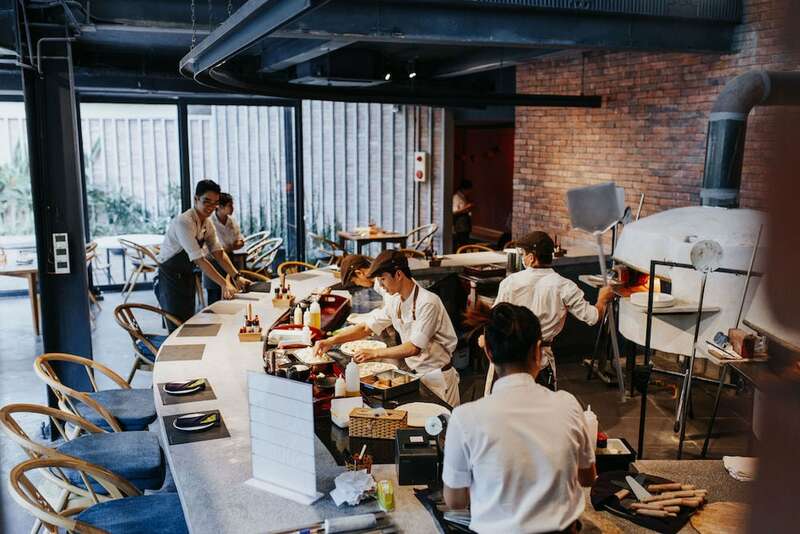 The idea for the restaurant chain grew from a pizza party in the founders’ backyard, and Takashi Niwa’s design recreates the garden party atmosphere through a serene but fashionable dining space. 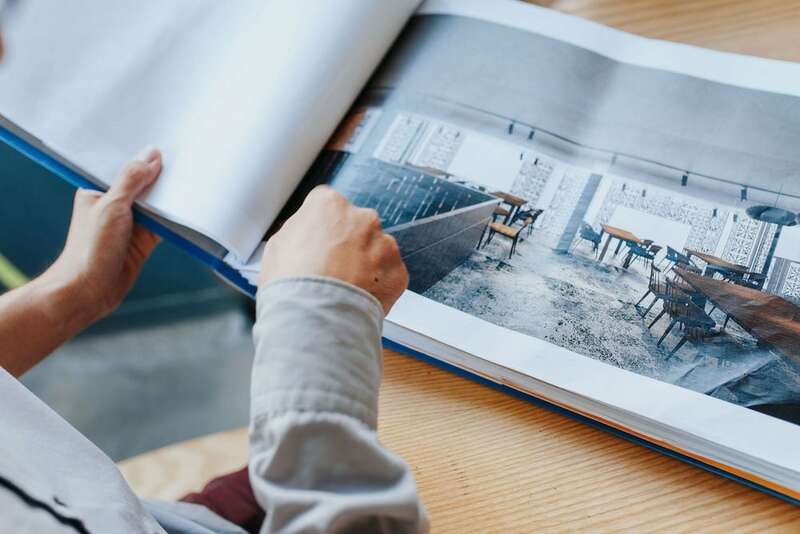 Flipping through his plans and sketches, Takashi Niwa took us through his earliest inspirations, his most famous projects, and the future of Takashi Niwa Architects. Takashi Niwa describing his earliest inspirations, his most famous projects, and the future of Takashi Niwa Architects. 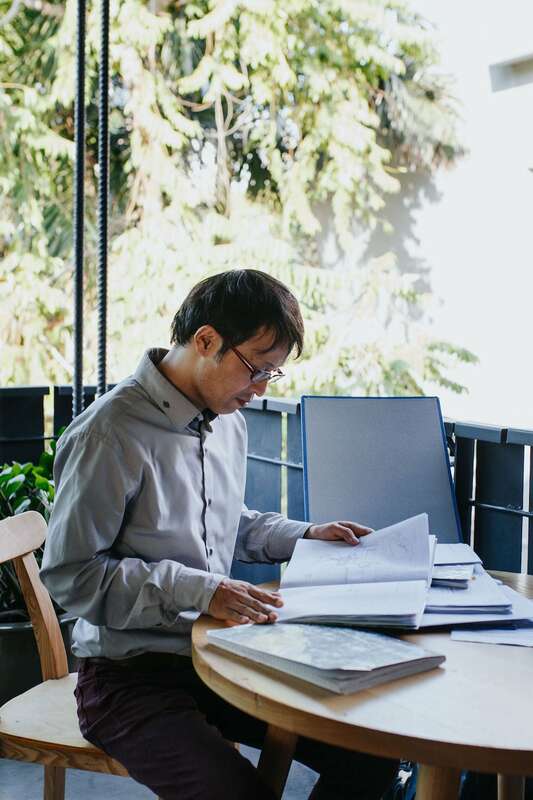 After finishing architecture school in Tokyo, you went on to pursue work in Japan. What kinds of projects did you first work on? After graduating with a Masters in Architecture from Tokyo Metropolitan University, I spent a couple of years gaining experience by participating in urban workshops, assisting architectural exhibitions, doing competitions, and working on projects with friends. During that time I collaborated with close friends in fields like urban design, civil design, engineering, lighting design, and research. This all helped me become the confident, versatile architect I hope I am today. When I was 25, I joined Noriaki Okabe Architecture Network (NOAN), a firm lead by Mr. Noriaki Okabe. He was driven by a desire to benefit wider society with design methods, and I was very interested in this approach. I wanted to develop my ideas based on his methods to connect product design and civil design. What were some of the early projects that most affected you as an architect? One of my earliest influences is the Toga Performing Arts Park Open Air Theatre designed by Arata Isozaki. I was most inspired by the exterior theater which opened up to nature. This project made me realize that architecture has the power to give people emotional experiences, especially coupled with the activities held in a space. Then there were two other projects which I took part in. The first was an 888m tower which made use of a couple of hyperbolic paraboloidal shell structures. The second is the JST factory in Malaysia, where thousands of workers product electrical components. Thanks to my time with Noriaki Okabe, I understood the importance of the user experience in design, particularly when it comes to designing lighting. Why did you decide to move from Japan to Vietnam, and what are some of the biggest differences you have noticed about the architectural practices between the two countries? In 1997, I met Vo Trong Nghia at a college in my hometown of Kanazawa. We shared a dormitory and soon became friends due to our love of ping pong. After a few years, we started collaborating on design competitions and projects, and this continued throughout university. 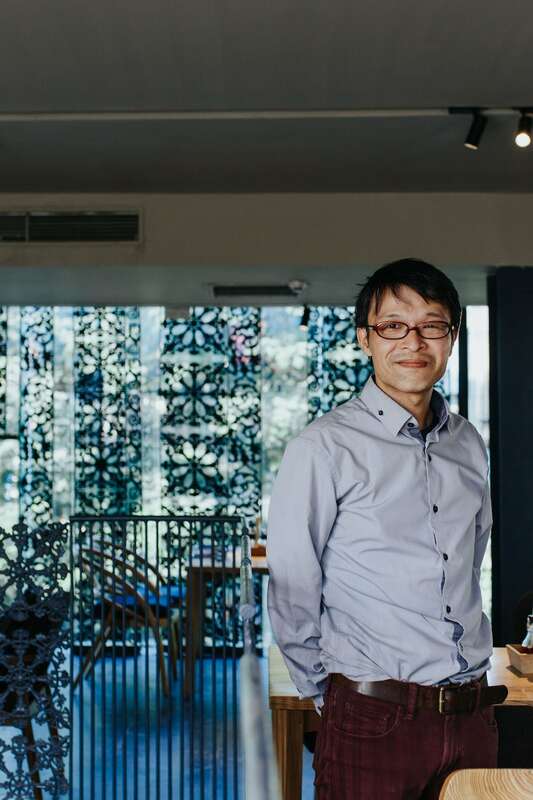 When Nghia returned to Vietnam to establish his own architectural firm, Vo Trong Nghia Architects (VTN), in Ho Chi Minh City in 2006, he invited me to become a partner. I joined VTN, moved to Hanoi, and opened the VTN Hanoi office in 2010. Working in Vietnam, I’ve realized that the biggest difference between this country and Japan is the planning process. In Japan, before approaching architects, clients usually have a detailed budget, purpose, function and schedule plans. However, in Vietnam, it is very different. The clients may have an idea but it is up to the architect to realize it. In the beginning, I was stressed about having so much freedom but now I enjoy this dynamic process. How do you adapt to the tropical climate here in Saigon? And the varying seasons in the north? Due to the tropical climate here, people often utilize semi-outdoor space. This is very interesting to me, especially when I compare it to the semi-outdoor spaces in my hometown, which are all geared towards activities for the snowy season. People here also enjoy more greenery in their spaces. I think using the power of plants and greenery is critical to design in a country with a tropical climate like Vietnam. A view down onto some of the greenery Takashi Niwa has deployed at his Pizza 4P’s Phan Ke Binh. In the North, however, it can be very humid. In my early days in Hanoi, I often asked engineers to consider how we can reduce humidity without using electricity, but I soon realized that this is very difficult. Instead, I changed my approach to creating comfortable spaces in a high humidity environment. One important factor is the reduction of heat radiation and another is natural ventilation or air flow in the space. We are able to learn a lot from “Nha San”, the Vietnamese traditional houses in mountainous areas which provide comfortable living spaces in harmony with nature. 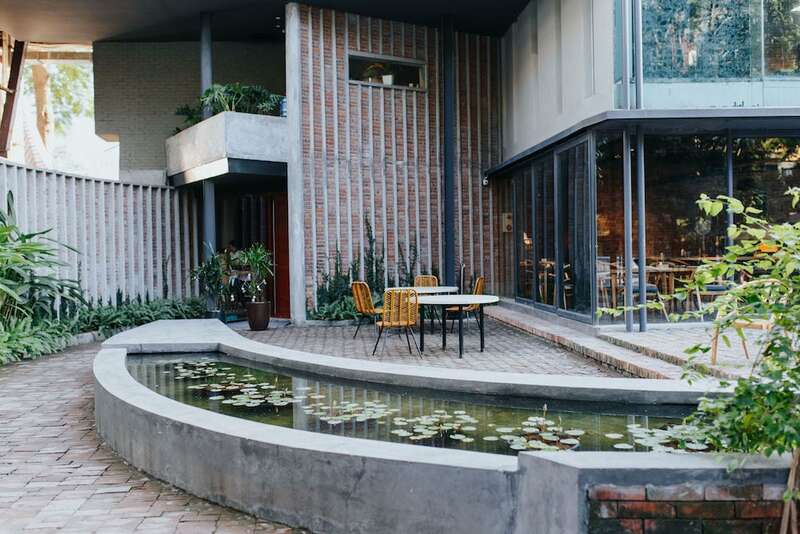 What has been the most difficult part of working as an architect in Vietnam? And the most pleasurable? In Vietnam, the fields of architectural design and engineering are very new, and the professionals in these fields are very young. 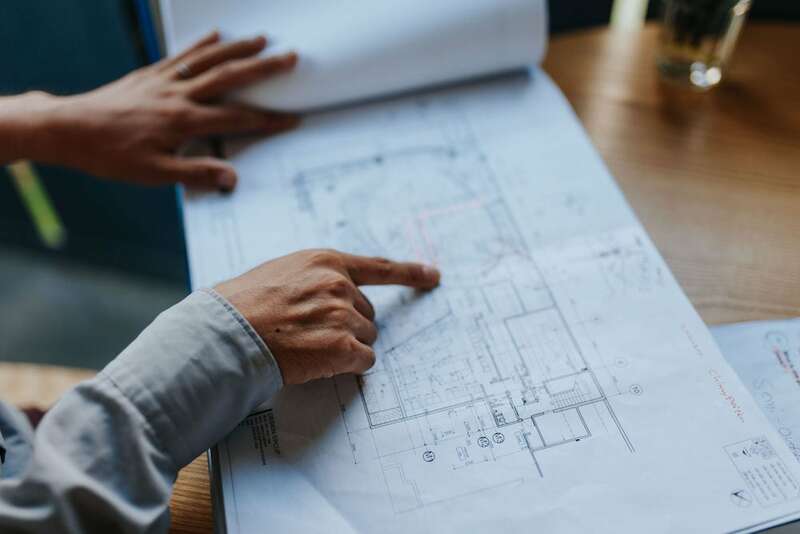 This means there are less experienced engineers to help in design, MEP, structural and civil engineering, and in construction roles like project and site management. The architect needs support from engineers to create good architecture. That is the main challenge for projects in Vietnam. On the plus side, Vietnamese clients have no fear of trying new designs and creating unique and interesting projects. This is a great time to create buildings that will stand the test of time and provide spaces for society. One of your most recent projects has been Pizza 4P’s in Phan Ke Binh. Tell us about the work you did on this—what was unique about the design of the restaurant? What was difficult about this project? Pizza 4P’s started with a handmade pizza oven in a home garden in Tokyo. The garden became a place for pizza parties and friendly cooking competitions among friends. So, I decided to design the space using the idea of a garden party. The original glass façade made the restaurant feel too close to the street. We addressed this issue by introducing locally made cast-iron to add a curtain-like screen between the guests and street. As with all the Pizza 4P’s venues, the pizza ovens take center stage. 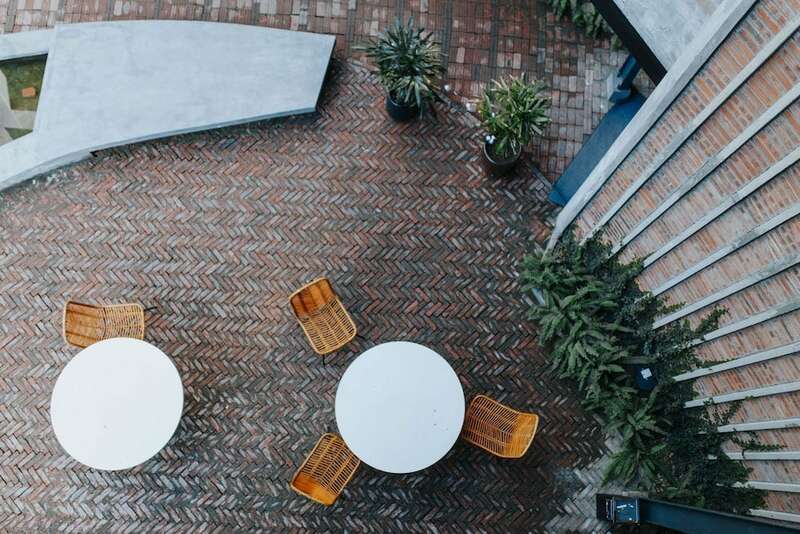 Another unique feature is the arrangement of plant patterns on the floor and furniture, designed to fill the entire restaurant with a garden atmosphere. Pizza 4P’s began as a garden party in Tokyo. Takashi Niwa drew on that idea in his design. 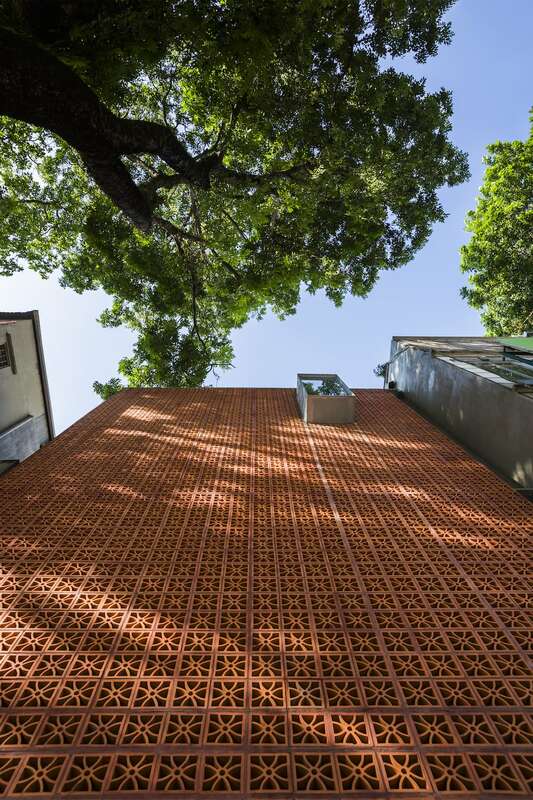 Another of your key projects is the Nanoco gallery in Hanoi. How did that project happen? Can you describe the design to someone who’s never seen it? 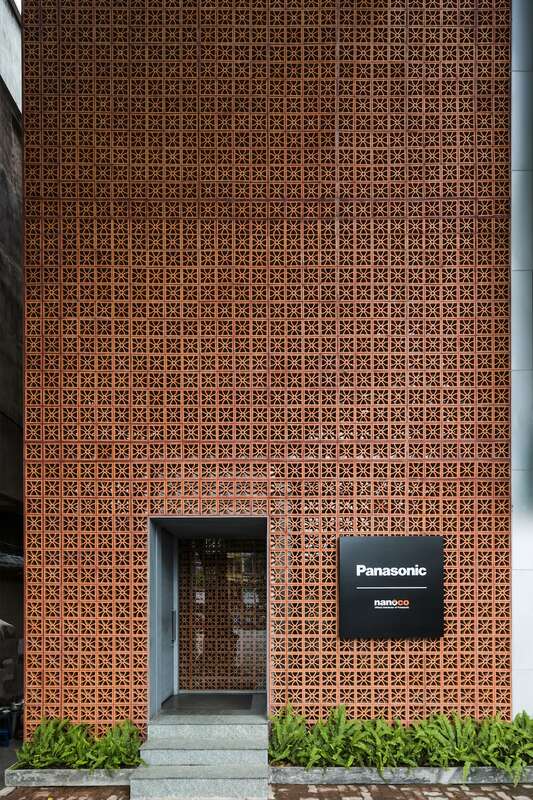 The Nanoco gallery is a showroom for Panasonic and Nanoco lighting products. The original building site faces a busy, noisy street, and there is a large tree in front of the building that makes it invisible and difficult to recognize. We started this project by considering how to reverse those disadvantages and turn them into advantages. Our solution was to utilize the big tree as a part of the building to create shadows and harmonize with the new building’s design. 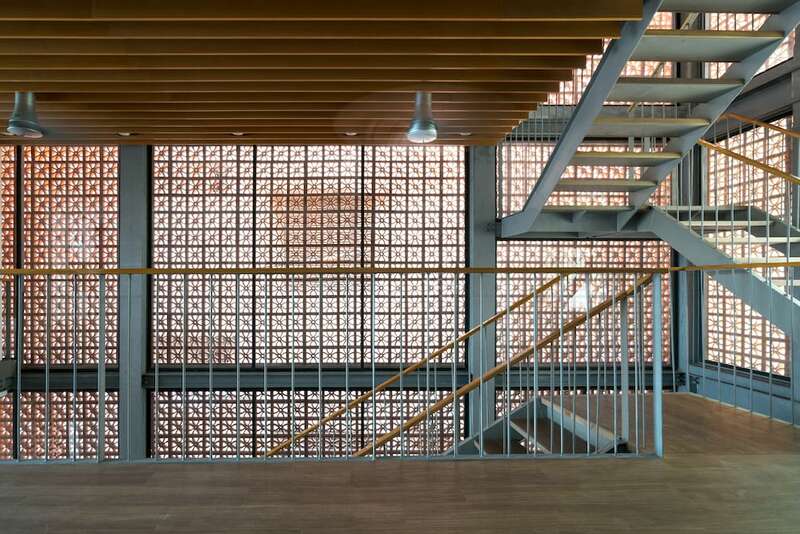 We designed the building like a simple, abstract box, using terracotta bricks with plant patterns, making the building looked like a lantern with its inside lights turned on. The traditional patterns contrast nicely with the greenery outside. Local materials like teracotta bricks and cast-iron are very popular in Vietnam. Even though they aren’t regarded particularly highly, they have the potential to be both environmentally friendly and aesthetically pleasing. It’s also our way of nodding to the beauty of the traditions of Vietnam. 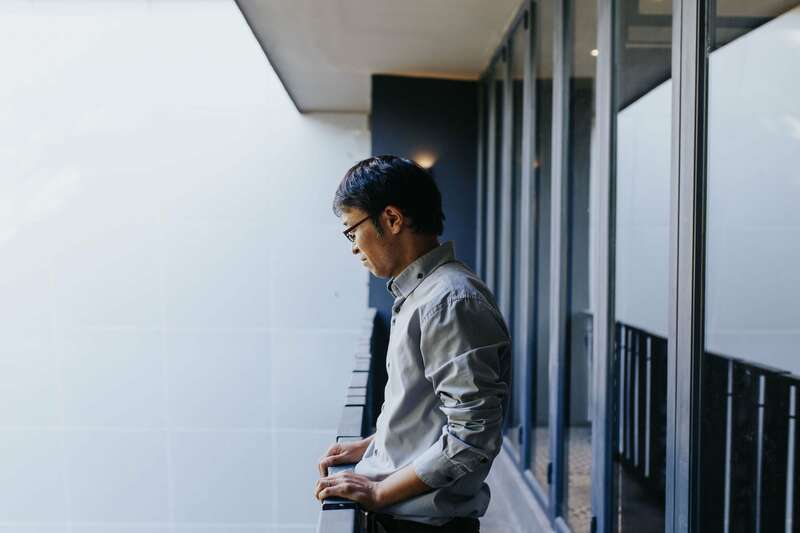 What is one goal you have for yourself, and for your architecture firm, for the next five years? My company’s approach is to combine “the best of environment and culture” and my goal is to create a unique team to achieve this vision. Environmentally, our goal is to marry green architecture with strong functionality that realizes the potential of a style of architecture that has its origins in Vietnam. As for culture, we aim to create unique designs that are meaningful to Vietnam. 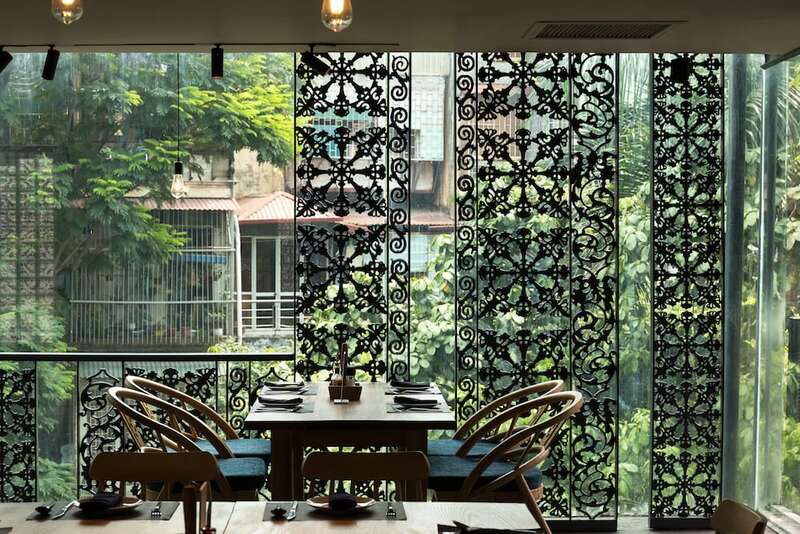 Vietnamese architects are very talented and we should utilize their strengths—like their technical skills, software development, and their sense of form—in our design process. I’m looking forward to great designs together with the team and I hope they take a leading role in developing a culture of Vietnamese architecture long into the future. …support and enhance people’s experiences in a space, and compliment the activities it’s designed for. Photos for Vietcetera by Nancy Zhou unless otherwise stated.